Cut the top off the bell peppers and remove the seeds. Place upright in a small casserole dish with 1/2 cup water in the dish. Cover loosely with plastic wrap. Microwave for 2 minutes. Prepare quinoa as directed on the package using the beef stock. Sauté chopped onions in a skillet with olive oil. Season with salt. When tender, add the ground beef and brown. Add chopped garlic and parsley. Season well with black pepper and paprika, to taste. Add the tomato sauce and simmer a few minutes to blend the flavors. Add the cooked quinoa. 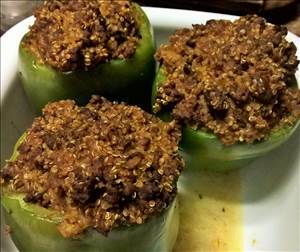 Stuff the beef and quinoa mix into the bell peppers. Bake in oven at 350 °F (175 °C) for 30 minutes. There are 216 calories in 1 serving of Stuffed Peppers II. Calorie break-down: 35% fat, 32% carbs, 33% protein.